Nancy Arabinick (left) and her daughter Natalie stroll the grounds of their parish, St. Charles Borromeo in Bensalem. Though raised non-Catholic, Natalie attended the parish school and asked to become Catholic. That led to her mother joining the Church, too. Nancy Arabinick and Pamela Murphy have two very different personalities but much in common. Both live in St. Charles Borromeo Parish, Bensalem; both are converts to Catholicism, Nancy two years ago and Pamela this year; and both were heavily influenced by their own children. In the words of Isaiah, “a little child shall lead them,” although in Pamela’s case, the child was no longer young. Nancy, who holds a PhD. in chemistry, belonged to the United Methodist Church but has a sister who converted to Catholicism 20 years ago. Sometimes Nancy and her husband John would take their little girl, Natalie, to a United Methodist service, sometimes her sister would take the child to Mass. When Natalie was of sufficient age, they enrolled her in St. Charles School where she was also exposed to Catholicism. At some point Nancy and her husband decided Natalie really should have a religion and asked her preference. 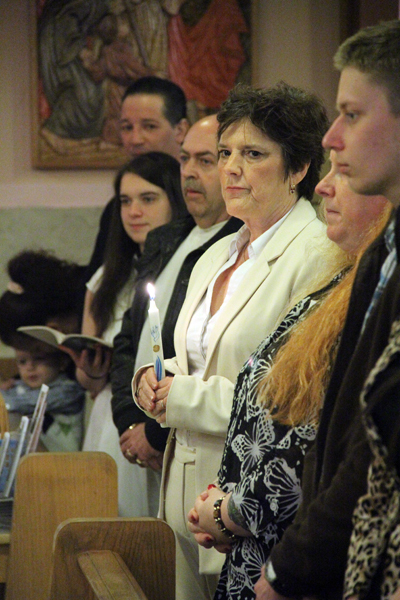 Pamela Murphy holds a candle during the rites held March 30 at St. Charles Borromeo Church in which she entered the Catholic Church. “I want to be Catholic,” the child said. Natalie had already been baptized in the United Methodist church, but because the baptismal certificate did not contain the critical wording Father, Son and Holy Spirit, she was given conditional baptism and set along the road to first penance and first communion. Her parents were still at times taking her to United Methodist services, but stopped when they realized the differences between the two faiths were clearly confusing the child. Nancy found herself being gradually drawn to Catholicism also, through the influence of her sister, her daughter’s lessons and the parents at St. Charles School. Finally she joined the RCIA program under the tutelage of Parish Services Director Marina Gallagher and loved it. Received into the church two years ago, she is actively committed to the parish, especially through the Home and School Association. She enjoys the pageantry of Catholic liturgy, but best of all the great gift of the Eucharist every week. “It’s the Body of Christ, it’s not just symbolism,” she said. Bishop John McIntyre welcomes Pamela Murphy into the Catholic Church. 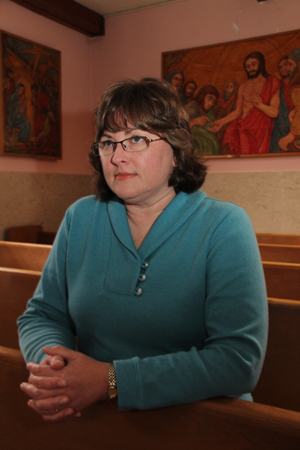 Pamela’s childhood faith was Mormonism, although there were Catholics in her extended family. “My stepmother is Catholic. She converted my father, but I lived with my mother who was not Catholic,” she explained. She married at the extremely early age of 14, and although she had three children the marriage did not survive. Over the years she lived in York, Pa., Cherry Hill and Pennsauken, N.J., and for the past decade, Bensalem. She sent her three children to Catholic schools in New Jersey for the quality of the education they would receive. That is the real genesis of her faith journey. At age 20 her eldest daughter, Christine, became a Catholic then fell away for a time but came back strong in the faith, as she remains to this day. Her second daughter, Barbara, became Catholic at 17 but eventually fell away. Her son did not become Catholic. Nancy Arabinick prays in a chapel of St. Charles Borromeo Church. Christine introduced her to Msgr. Duncan and Marina Gallagher, and she started instruction a year and a half ago, and finally at the Easter Vigil she was welcomed into the Church. Now she is working on two of her grandchildren who were never baptized, and is hoping to bring them into the Church too. There was one minor glitch before Pamela’s entry into the Church. Five years ago she had remarried, and although divorced, from the Church’s point of view her first marriage had to be annulled, something simplified by her extreme youth at the time of her first marriage. 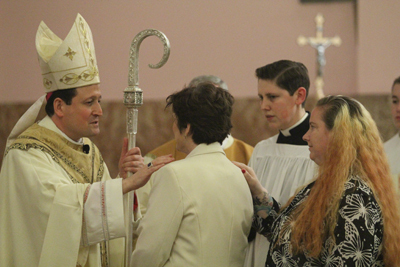 Just the week before Easter the annulment came through, and Msgr. Duncan blessed the marriage of Pamela and her husband, Gerard.